Important to any distributed system designed with security in mind is verifying both the source and the integrity of data entering the system. Consumers of the data need to be able to verify both the publisher (source) of the data, as well as ensure it's not been modified after it was published (integrity). Azure Container Registry supports both by implementing Docker's content trust model, and this article gets you started. As an image publisher, content trust allows you to sign the images you push to your registry. Consumers of your images (people or systems pulling images from your registry) can configure their clients to pull only signed images. When an image consumer pulls a signed image, their Docker client verifies the integrity of the image. In this model, consumers are assured that the signed images in your registry were indeed published by you, and that they've not been modified since being published. Content trust works with the tags in a repository. Image repositories can contain images with both signed and unsigned tags. For example, you might sign only the myimage:stable and myimage:latest images, but not myimage:dev. Content trust is managed through the use of a set of cryptographic signing keys. These keys are associated with a specific repository in a registry. There are several types of signing keys that Docker clients and your registry use in managing trust for the tags in a repository. When you enable content trust and integrate it into your container publishing and consumption pipeline, you must manage these keys carefully. For more information, see Key management later in this article and Manage keys for content trust in the Docker documentation. This was a very high-level overview of Docker's content trust model. For an in-depth discussion of content trust, see Content trust in Docker. Your first step is to enable content trust at the registry level. Once you enable content trust, clients (users or services) can push signed images to your registry. Enabling content trust on your registry does not restrict registry usage only to consumers with content trust enabled. Consumers without content trust enabled can continue to use your registry as normal. Consumers who have enabled content trust in their clients, however, will be able to see only signed images in your registry. To enable content trust for your registry, first navigate to the registry in the Azure portal. Under POLICIES, select Content Trust (Preview) > Enabled > Save. To work with trusted images, both image publishers and consumers need to enable content trust for their Docker clients. As a publisher, you can sign the images you push to a content trust-enabled registry. As a consumer, enabling content trust limits your view of a registry to signed images only. Content trust is disabled by default in Docker clients, but you can enable it per shell session or per command. docker build --disable-content-trust=false -t myacr.azurecr.io/myimage:v1 . docker build --disable-content-trust -t myacr.azurecr.io/myimage:v1 . Only the users or systems you've granted permission can push trusted images to your registry. To grant trusted image push permission to a user (or a system using a service principal), grant their Azure Active Directory identities the AcrImageSigner role. This is in addition to the Contributor (or Owner) role required for pushing images to the registry. Details for granting the AcrImageSigner role in the Azure portal and the Azure CLI follow. Navigate to your registry in the Azure portal, then select Access control (IAM) > Add role assignment. Under Add role assignment, select AcrImageSigner under Role, then Select one or more users or service principals, then Save. 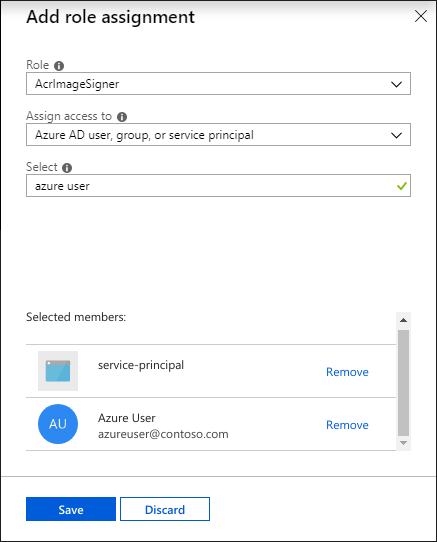 In this example, two entities have been assigned the AcrImageSigner role: a service principal named "service-principal," and a user named "Azure User." For example, to grant yourself the role, you can run the following commands in an authenticated Azure CLI session. Modify the REGISTRY value to reflect the name of your Azure container registry. You can also grant a service principal the rights to push trusted images to your registry. Using a service principal is useful for build systems and other unattended systems that need to push trusted images to your registry. The format is similar to granting a user permission, but specify a service principal ID for the --assignee value. The <service principal ID> can be the service principal's appId, objectId, or one of its servicePrincipalNames. For more information about working with service principals and Azure Container Registry, see Azure Container Registry authentication with service principals. To push a trusted image tag to your container registry, enable content trust and push the image with docker push. The first time you push a signed tag, you're asked to create a passphrase for both a root signing key and a repository signing key. Both the root and repository keys are generated and stored locally on your machine. After your first docker push with content trust enabled, the Docker client uses the same root key for subsequent pushes. On each subsequent push to the same repository, you're asked only for the repository key. Each time you push a trusted image to a new repository, you're asked to supply a passphrase for a new repository key. When you run docker pull, the Docker client uses the same library as in the Notary CLI to request the tag-to-SHA-256 digest mapping for the tag you're pulling. After validating the signatures on the trust data, the client instructs Docker Engine to do a "pull by digest." During the pull, the Engine uses the SHA-256 checksum as a content address to request and validate the image manifest from the Azure container registry. Along with the locally generated root and repository keys, several others are generated and stored by Azure Container Registry when you push a trusted image. For a detailed discussion of the various keys in Docker's content trust implementation, including additional management guidance, see Manage keys for content trust in the Docker documentation. If you lose access to your root key, you lose access to the signed tags in any repository whose tags were signed with that key. Azure Container Registry cannot restore access to image tags signed with a lost root key. To remove all trust data (signatures) for your registry, first disable, then re-enable content trust for the registry. Disabling and re-enabling content trust in your registry deletes all trust data for all signed tags in every repository in your registry. This action is irreversible--Azure Container Registry cannot recover deleted trust data. Disabling content trust does not delete the images themselves. To disable content trust for your registry, navigate to the registry in the Azure portal. Under POLICIES, select Content Trust (Preview) > Disabled > Save. You're warned of the loss of all signatures in the registry. Select OK to permanently delete all signatures in your registry. See the Docker documentation for additional information about content trust. While several key points were touched on in this article, content trust is an extensive topic and is covered more in-depth in the Docker documentation.